This is part sixteen in a series that will occupy the “money hacks” slot at Get Rich Slowly during April, which is National Financial Literacy Month. 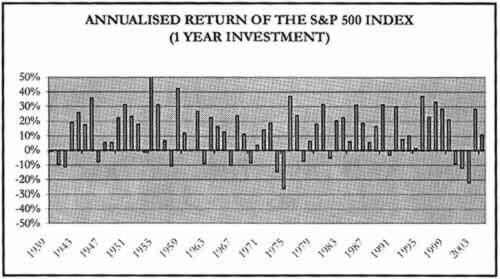 In this video, Michael uses several graphs to demonstrate how long-term investments in the stock market tend to minimize short term fluctuations. Because these exhibits are difficult to see in the presentation, I’ve scanned them from his book, Saving and Investing. The market’s returns fluctuates wildly from one year to the next. 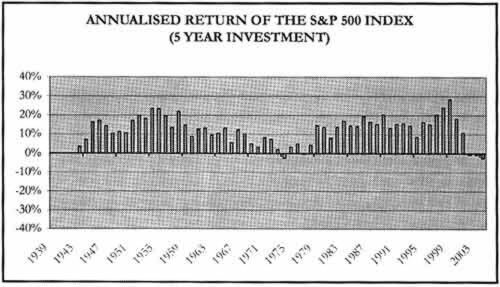 Even three-year periods show a huge range of returns, from -15% to +30%. But move to five-year periods, and there are only a few minor dips into negative territory. 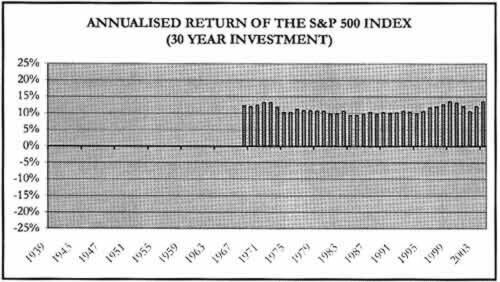 At ten years, there’s not a single period that yielded a negative return. 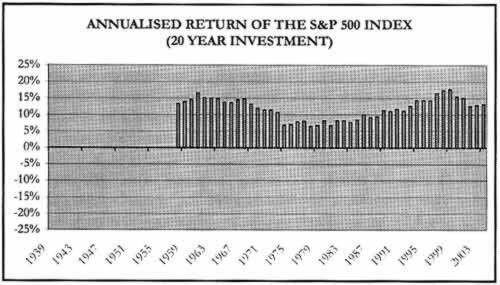 When we look at twenty-year investment periods, the numbers are strongly positive. 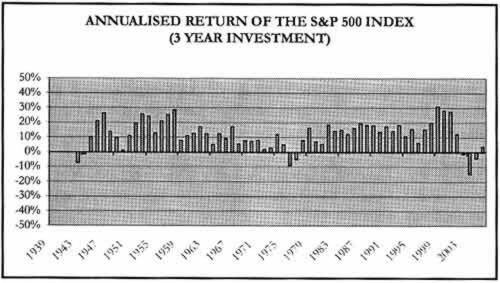 At thirty years, we see average annualized returns of 9-14%. 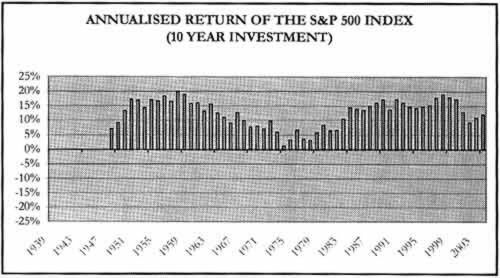 Now you know why it’s often claimed that the market offers a 12% average annualized return. Over the long-term, it certainly does. They key, though, is to minimize exposure to factors that would reduce this return. You can’t do anything about inflation, but you can take steps to reduce taxes and to avoid transaction fees. Michael Fischer spent nine years at Goldman Sachs, advising some of the largest private banks, mutual fund companies and hedge funds in the world on investment choices. Look for more episodes of Saving and Investing at Get Rich Slowly every weekday during the month of April. For more information, visit Michael’s site, Saving and Investing, or purchase his book.